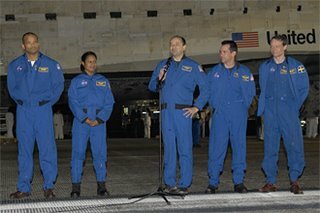 Commander Mark Polansky and the STS-116 crew are back home in Houston for the holidays. They arrived at NASA's Johnson Space Center on Saturday, a day after landing at NASA's Kennedy Space Center in Florida, wrapping up a resoundingly successful mission to rewire the International Space Station and retract a stubborn solar array. Polansky thanked everyone at KSC after the landing. "This mission is really a demonstration of how well we can work as a team at NASA when the ground folks, and the contractors, the crew, the flight directors, the control teams when everybody works together toward a common goal." "On behalf of the crew at the Kennedy Space Center, Christmas came three days early for us," agreed Launch Director Mike Leinbach during the post launch news conference. "The team is just jubiliant." + Post-Landing News Conference Transcript (53 Kb PDF)During their nearly 13 days in orbit, the crew installed the P5 spacer truss segment and rewired the station's power system. Discovery also delivered a new station crew member, Sunita Williams, and brought astronaut Thomas Reiter home after six months on the station. They delivered more than two tons of supplies to the station and brought nearly as much back home.